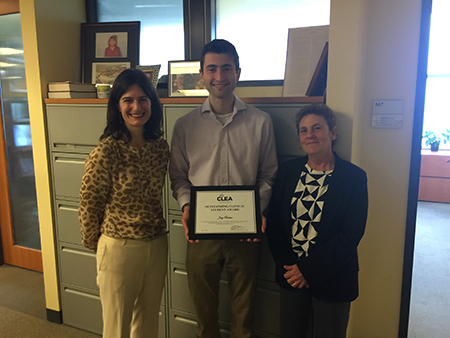 Earlier this month, Joseph Becker (JD ’18) became the first Northwestern Pritzker School of Law student to win the Clinical Legal Education Association (CLEA)’s Outstanding Student Award for his work in the Bluhm Legal Clinic’s Civil Litigation Center. Becker was nominated by Laurie Mikva, a clinical assistant professor with the Civil Litigation Center, who had Becker in her clinic for four consecutive semesters. “In the Civil Litigation Clinic, Joey has represented dozens of clients threatened with eviction. With enthusiasm, dedication, empathy and boundless hard work, he has helped his clients keep their housing subsidies and maintain their housing at least until they are able to find other places to live,” Mikva said. Becker graduated earlier this month, and is preparing to take one of his remaining cases to trial next month as he simultaneously studies for the bar exam.